Statistical Graphics and more » Blog Archive » Statistics is dead, long live Statistics! Statistics is dead, long live Statistics! Posted on 05/26/2016, 14:02, by martin, under Big Data, General, References. taken from the full statement in The American Statistician. For me this sounds like “the end” of classical statistics as a sub-discipline of mathematics. 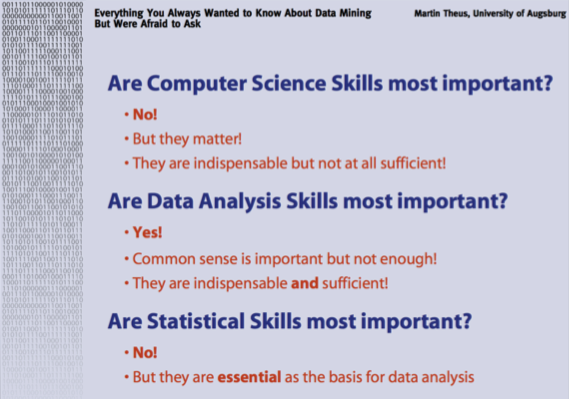 The cause seems to be obvious for me: In the light of Data Science as a widely promoted but hardly defined discipline, statistics seems to lose ground more and more. Unfortunately, the ASA does not really deliver new directions, that would make the ordinary statisticians more future proved. Is this new? I would say, no. Ever since John Tukey promoted EDA (Exploratory Data Analysis, for those who are too young to know) we got new directions from someone who really knew the math behind statistics and as a result saw the limitations. Nothing new, really, and 15 years ago in the light of the buzz word “Data-Mining”. But the point is the same. Does the statistics community react too late, and is now doomed to diminish towards insignificance? Thanks for posting. 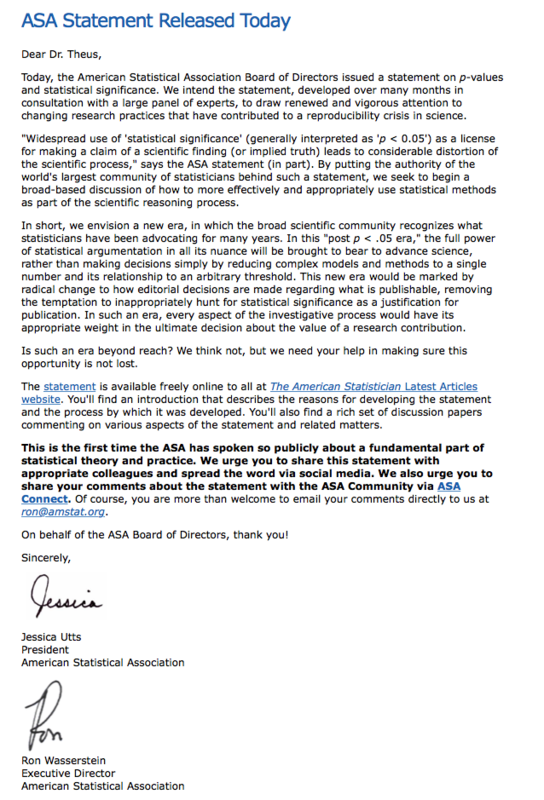 At last some reaction from the statistical community on the way science is conducted and judged. However I do fear it may be too late. Maybe if some of the scientific journals would require a new approach…but I doubt they dare.